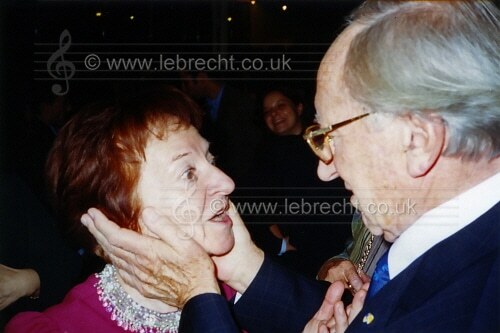 Herman Krebbers, formidable concertmaster of the Haitink-era Concertgebouw Orchestra, died on Wednesday at a great age. 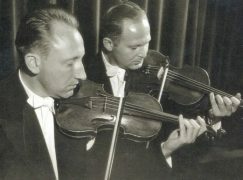 Krebbers was appointed joint concertmaster at the Residentie Orchestra in The Hague in 1951 together with his close friend Theo Olof. The pair moved together in 1962 to preside over the Concertgebouw strings. They were the best frontline partnership in Europe. Olof stepped down in the early-1980s, around the time that Krebbers’ activities were restricted as the result of an accident. Krebbers had been a formidable soloist. His recording of the Beethoven concerto with Haitink was for many years the go-to recording for first-time listeners, accurate and passionate in equal measure. He went on to become a sought-after teacher. Frank Peter Zimmermann was among his star pupils. I grew up with his recording of the Brahms concerto…loved it. A life well lived. He would have lived there during the privations of WW2 presumably. That would be worth a book in itself. How appropriate that Krebbers’ successor as a concert master of the Concertgebouworkest, Jaap van Zweden, will conduct the (now) Royal Concertgebouworkest this Sunday. The performance of Bruckner VIII will be dedicated to the memory of Krebbers. Live on Dutch Radio4 (also by internet) at 14.00 h (GMT +2). By the way, his most famous pupil worldwide for sure is nowadays entertaining millions of people with easy going but honest performances of classical music: André Rieu. Was Bernard Haitink a Krebber’s student? I suppose the age difference isn’t great enough. It’s more probable that they both had the same violin teacher.